The British whisky retailer Master of Malt sent me a couple more samples from their Drinks by the Dram program that I wrote about back in January. Drinks by the Dram is a slick way to try some scotches you wouldn't otherwise be able to afford, or that you might splurge on if you knew you were going to enjoy it. That's pretty well illustrated by these two recent samples, bottled under the store's own label. First up, an unusual single-cask 30 year-old Caol Ila. I love Caol Ila's standard bottlings, especially the 18. On the other hand, the little exposure I've had to really old scotches has led me to believe they aren't necessarily for me. This fits the Drinks by the Dram model really well: I wouldn't risk $135 on a bottle of it, but I can't deny that I'm curious how it would taste. Similarly with the second sample, a single-cask 13 year-old Highland Park. In this case, I'm not a huge fan of the distillery, but this is a non-sherried expression -- it was aged in bourbon barrels -- so again, my curiosity is piqued. And the $5 sample price is tough to beat. Dave next door is at least as big a peat freak as I am, so I took the samples over the other night so we could talk them over. (The picture above is a glass with my half of the Caol Ila -- double that to get an idea of the sample size.) We agreed that the Caol Ila was stunning, but neither of us was very impressed by the Highland Park. Caol Ila: Pretty hot and intense: 57% ABV. As expected for 30 y.o., a little dusty and astringent at first (maybe even a pine tar sensation), but it opens up on the tongue, for a long, complex finish. Smoky, but not overpoweringly so, less than my recollections of "regular" Caol Ila. If you can bear to add a drop of water -- literally a single drop -- it takes a little of the initial astringency off. Very good dram. Highland Park: Not a huge fan of the distillery, but it's interesting to have a non-sherried sample. Very sweet in a surprising way. I miss the sherry; I think it would help with a vegetal or mushroomy taste that's present. I wouldn't recommend it except for someone who is a Highland Park follower that wants to try something quite different from the usual expressions. 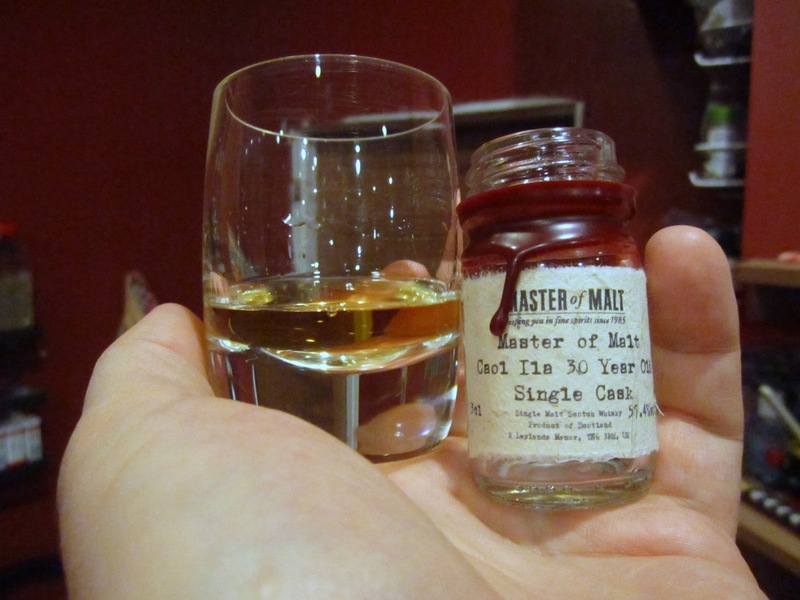 By the way, as part of my half-hearted attempt to make some money off of It's Pub Night, I've enrolled in Master of Malt's partner program, because I think it's a pretty good service they're offering, plus U.S. customers can request a VAT refund on orders -- effectively a 16% discount. Master of Malt will give me a kickback if you buy something after arriving there from the links in this post, or from the links to them I've put in the blog sidebar (with a few other moneymaking schemes under the "Monetize Me" headline). I don't expect to make a dime off it, but if you're going to buy something from them, click one of my links so they'll know I sent ya. I should get in on this. It captivated me when you wrote about it before, too. I would be scared to add water to a malt I hadn't tried and had so little of, though.